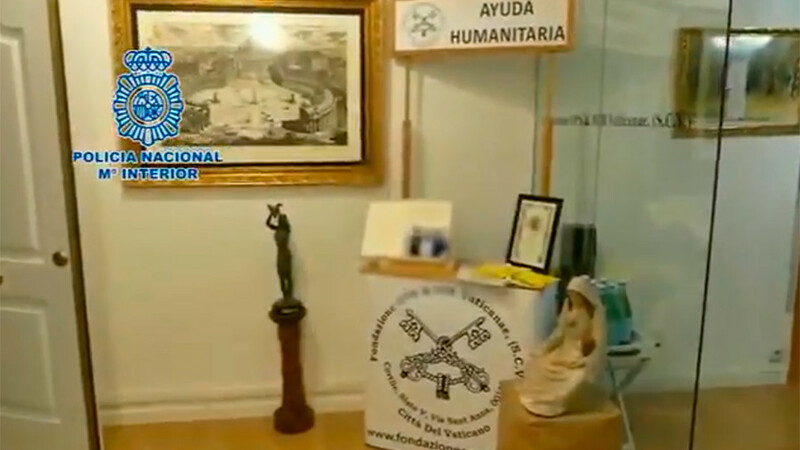 Police in Spain have raided a fake branch of the Vatican Bank following accusations that it was swindling huge profits from contracts signed with companies around the world. Footage released by Spain’s National Police shows the group’s office in the seaside resort of Fuengirola near Marbella on the country’s southern coast. The Vatican shield can be seen emblazoned across the windows and chairs in the offices as well as on a luxury vehicle parked outside the property. “As well as a lot of paperwork, agents seized a sailboat in the Fuengirola marina, several high-end cars, 64,000 euros in the main suspect's checking account, many luxury watches, technological supplies, silver ingots, point of purchase devices, a firearm with blanks and 5,000 euros in cash," Spanish police said in a statement. The phoney bank purported to offer trade relations and advice to international companies. Catholic symbols and iconography such as statues of the Virgin Mary were placed around the office to complete the subterfuge. The Vatican Bank does not have any other outlets outside of Vatican City. Officers arrested three Spaniards and a Colombian national in the operation. It’s claimed that a 30-year-old Spanish national presented himself as a member of the Vatican’s diplomatic corps. He also allegedly carried papers identifying him as a Cuban ambassador. The real Vatican Bank has been no stranger to controversy itself in recent years. In 2009, a book by Giangluigi Nuzzi found that the bank facilitated the creation of fake charity accounts used for political donations, laundering and embezzlement. In 2012, four priests came under investigation for allegedly operating accounts for Mafia money-laundering operations.